Depending on how comfortable you are with swimming, wandering far into the deep end can be either exhilarating or borderline panic-inducing. If you tend to experience the latter when you can no longer touch the bottom, then maaaybe stay away from a new giant new pool that claims to be the world’s deepest. An enormous new pool in Poland, appropriately called the Deepspot, will hold 8,000 cubic meters of water, according to a report by CNN. That’s roughly 27 times the volume of an average 25 meter pool. It will include a simulated “blue hole” plunging pool, which will allow divers to travel down to the man-made swim spot’s deepest point (45 meters, or 148 feet).The Deepspot will also feature underwater caves and overhangs to explore. The pool is being marketed as an ideal training spot for professional scuba divers, though designers say beginners will also be able to enjoy it as well. If you want to check out the pool, but aren’t much of a diver, or just don’t want to get wet, Deepspot will also feature an underwater tunnel for spectators to check things out from dry land. Surrounding conference/training suites and hotel “rooms with a view” will also look into the massive pool’s interior. The pool is still under construction, but once it’s finished this fall, you can find it in the town of Mszczonów, Poland -- roughly 20 miles from Warsaw. It’ll take the title of world’s deepest pool from Y-40 Deep Joy in Italy’s Hotel Millepini, but it won’t hold the title for long. Apparently, another insanely deep pool is being built in Colchester, England in 2020. 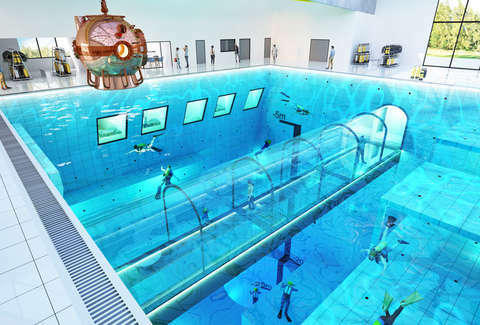 The pool, called the Blue Abyss, will be 50 meters deep and double as a “commercial astronaut training center... And a human performance center helping people reach the peak of their physical capabilities,” John Vickers, the pool project’s managing director, said per the report. Diving into the world’s deepest pool sounds cool and all, but if you’re just looking to lounge poolside and do a few canon balls this summer, you should probably just stick with your go-to pool. That’s where we’ll be at least.